Who wouldn’t want their own oil well? You might be able to use the lyrics to the Beverly Hillbillies theme song when you give this personalized sculpture as a gift or award. 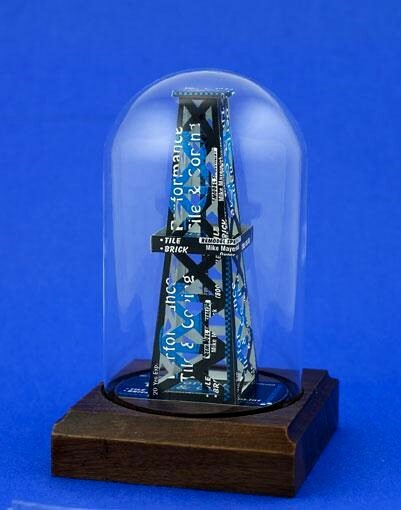 If you’re looking for a gift for an oilman or other successful entrepreneur, Business Card Sculptures’ Oil Well is sure to please. This design is handcrafted using about 20 business cards. 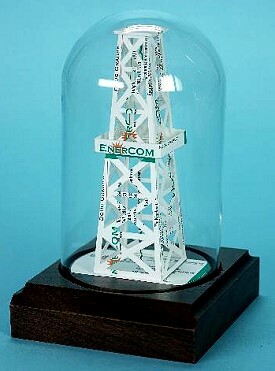 See other gift ideas for the Oil Patch here. The actual song title is The Ballad of Jed Clampett and it was written by Paul Henning, who created the series and wrote many of the 274 episodes. It was sung by Jerry Scoggins with music by Flatt & Scruggs. The show ran on CBS from September of 1962 to to March of 1971.